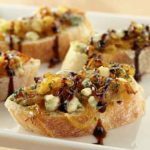 A recipe for bread lovers and lovers of good balsamic vinegar, such as Mia Bella Traditional Balsamic Vinegar. 2 Tbsp Balsamic Vinegar Mia Bella Traditional Balsamic- preferredMelt butter in a nonstick skillet over medium-high heat. Stir in onions, salt and pepper. Continue cooking, stirring occasionally, for 5 minutes or until onions begin to soften. PRO TIP: Garnish with bacon bits.